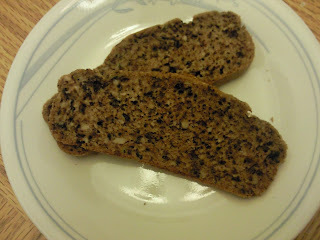 Use my bread recipe, except grease muffin tins instead of a bread loaf pan. Scoop dough into muffin tins by using a spring release cookie dough scoop (1 1/2"- 2" size). Cover and allow to rise for 20 minutes. Then bake at 400F for 20-25 minutes. After 15 minutes, top with soy-free margarine to help with browning. 1. Mix potatoes, egg, parsley, and onion powder. 3. Form into 6 patties about 1/2" thick. 5. Saute in canola oil over medium heat, adding more as needed, until crispy and golden brown on both sides. 2. In a medium bowl, combine flour, baking powder, sugar and salt. Cut in the shortening. 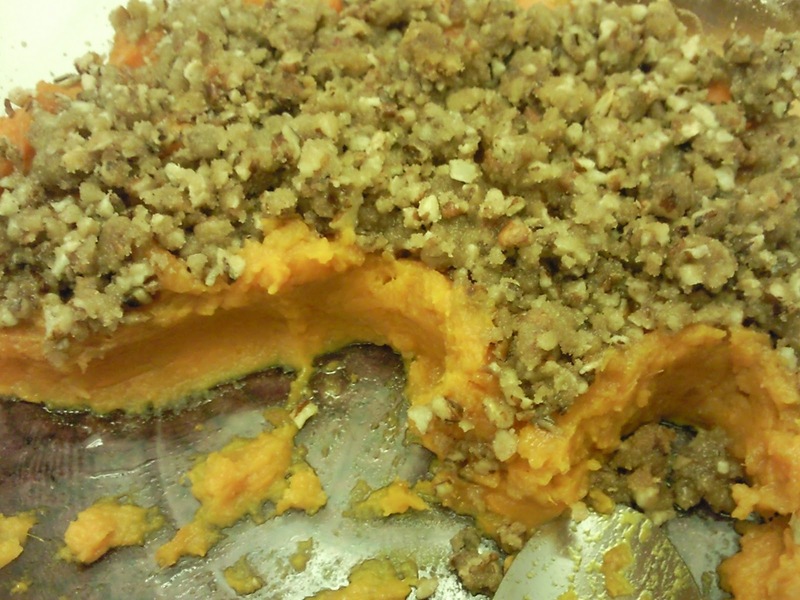 Mix in the sweet potatoes, and enough milk to make a soft dough (I needed 1/4 cup). 3. Turn dough out onto a floured surface, and roll or pat out to 1/2" thickness. Cut into circles using a biscuit cutter. Place biscuits onto a greased baking sheet. 4. Bake for 12-15 minutes, or until golden brown. Once again, I'm using up my leftover turkey and trying to change the flavors enough that my family will not think they are eating leftovers...and this was beyond a success, if stuffing yourself until you're ready to pop, counts as a success. 2. Combine masa, flour, baking powder and salt. Add shortening and water. Knead until all ingredients are well blended and you are able to form a ball. Divide dough into 14 balls. Keep dough cover. Using a rolling pin or your hands, press each ball out to form a circle that has about a 5-inch diameter (don't worry if they are smaller) and is 1/4" thick. 3. To form and cook the gorditas, lay gordita on preheated griddle. Cook each side for 2-3 minutes or until lightly browned. While still wearm, pinch edge to form a 1-inch rim. It should look like a small saucer. 4. Preheat over to 170F. Line a cookie sheet or baking pan with paper towels. Set aside. 5. To fry gorditas, use a large frying pan. Add enough oil to cover bottom and fry 2 to 3 gorditas at a time for 1 to 2 minutes, turning frequently, until both sides are golden brown and crisp. 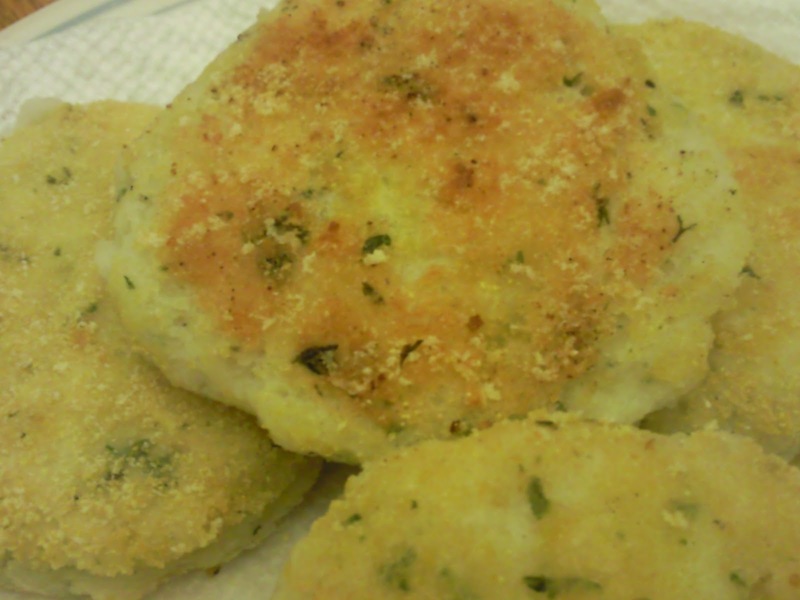 Place fried gorditas in the baking pan and set in oven to keep warm. 6. Top with whatever toppings you like...shredded beef, pork, or my turkey and green chilies below, along with lettuce, tomatoes, etc. This post is featured on The Whole Gang's Real Food Weekly. 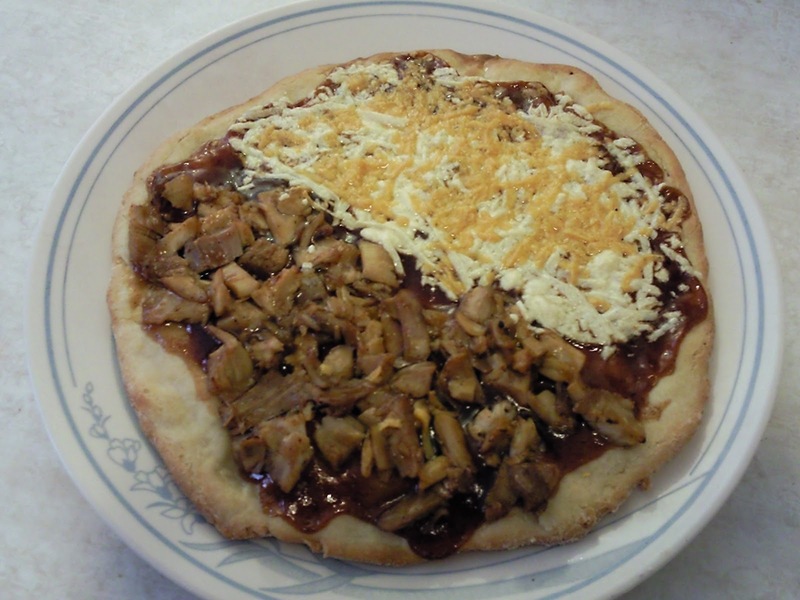 Toss turkey with 1-2 tablespoons of barbecue sauce, set aside. 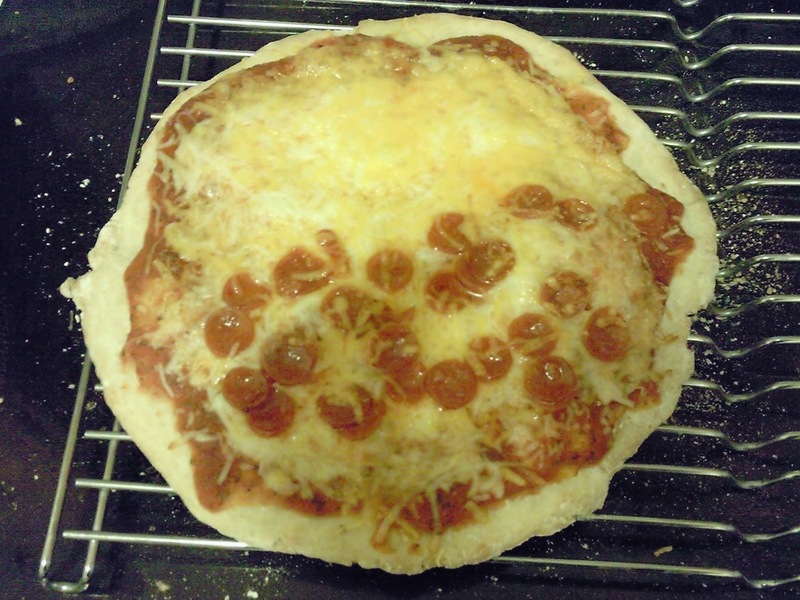 Brush Pizza Crust with Olive Oil. Spread the rest of the barbecue sauce onto the pizza crust and top with turkey and cheese. 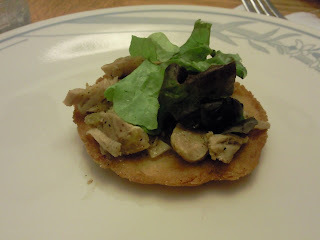 In my Thanksgiving menu, I mentioned that I was going to make this to snack on, and of course, I did. But when I made it, I was reminded how little I like measuring out 9 cups of cereal...in fact, I refuse to do that. 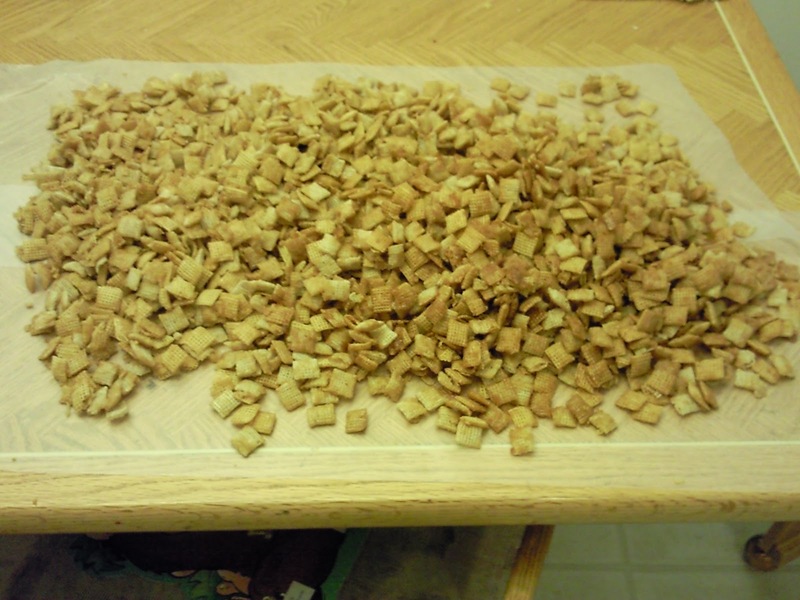 Why does Chex make recipes that don't just allow us to dump the box of Chex (which contains about 13 cups), instead of measuring it out? So, I've posted their recipe modified, so I can use the whole box, well, both boxes actually, and use a saucepan and oven instead of the microwave. Warning, this makes a ton, and you will eat it all! 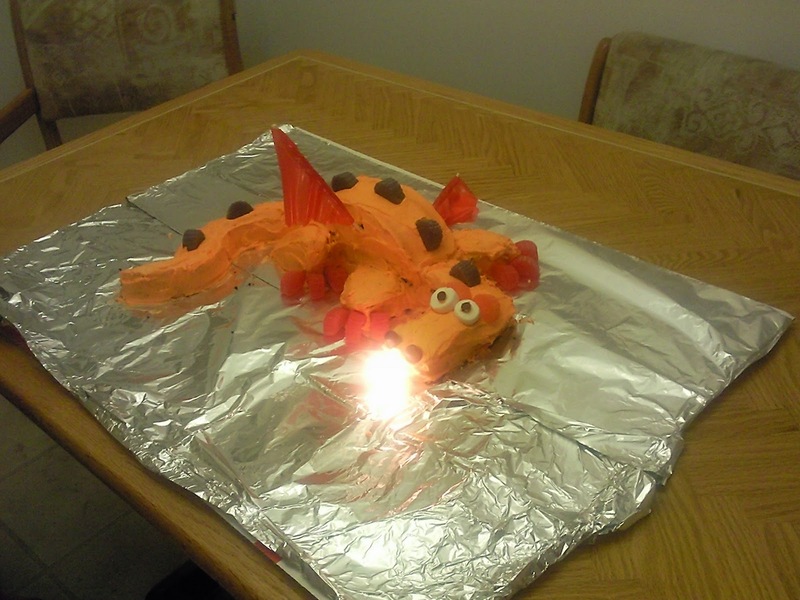 Oh, and of course, it's gluten-free, dairy-free and soy-free! 1. Heat oven to 250F. Spray a couple of large cookie sheets and/or roasting pans with cooking spray. Dump cereal into pans. 2. In a large saucepan, stir together brown sugar, margarine, and corn syrup. Cook and stir 8-9 minutes over medium-high heat until mixture starts to boil. Boil 1 minute, stirring constantly. 3. Remove from heat. Stir in baking soda. Pour over cereal mixture, stirring until evenly coated. 4. Bake 40-50 minutes, stirring every 15 minutes, until coating is set. 5. Spread on waxed paper to cool, about 10 minutes. Break into pieces and store in an airtight container. Turkey, of course, I'm using Alton Brown's Honey Brine Recipe and then cooking it in an oven bag to keep it moist. Gravy, I'm not too worried about it, but I am going to use Triumph Dining's guidelines (but soy-free margarine, instead of butter), mostly because I'm curious about using the sweet rice flour in the gravy. Cook celery, onion, and sausage in hot margarine until tender and sausage is no longer pink. Remove from heat. Stir in sage and pepper. Place dry bread cubes in a large bowl (make sure it is very large so you have room to stir -th ebread will shrink down as you add the liquid); add onion mixture. Drizzle with enough chicken broth to moisten, tossing lightly to combine ( adjust liquid depending on how moist/crispy you like your stuffing). Place stuffing in a greased 2-quart casserole. Bake, covered, at 325 degrees for 30 to 45 minutes or until heated through. Remove the cover during the last few minutes if you like a crispy top on the stuffing. Sweet Potato Casserole, probably my favorite side every year, I'm using my recipe from the blog. 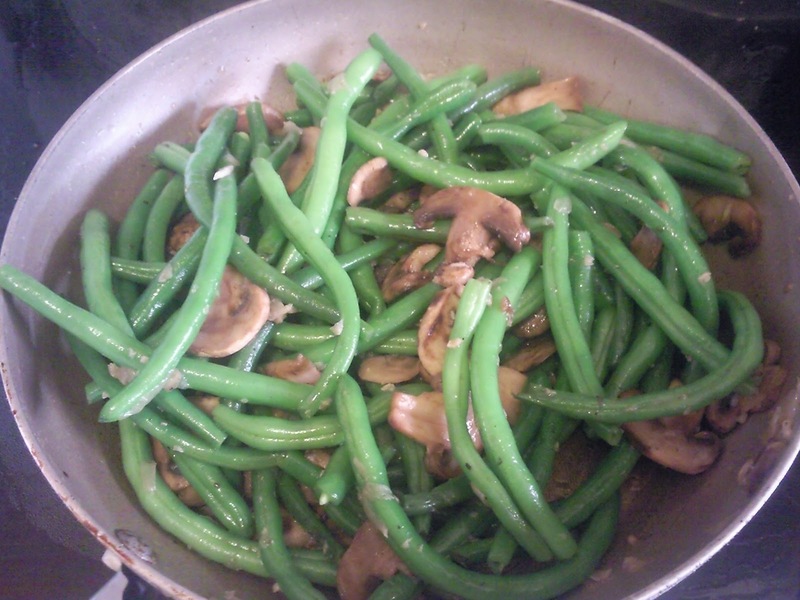 Green Beans, I know that green bean casserole is a tradition in most homes, but not in mine, but I do love green beans and mushrooms, so I'll do my green bean mushroom saute. Steamed Corn...simple I know, but this is about the only cooked vegetable my husband likes, so I have to have it on the table. Pumpkin Chip Muffins, from my blog. I actually have some frozen, so I'll just thaw them, can't get easier than that! Apple Crisp, I'm using my crisp recipe, just subbing apples for the raspberries and peaches. I decided against pie, because crisp is easier and man, I'm making everything, might as well make it easier on myself. And if that isn't enough for all 5 of us ;) I thought I'd have deviled eggs as an appetizer while we're waiting on food to cook, using canola oil mayonnaise to make them safe for everyone. 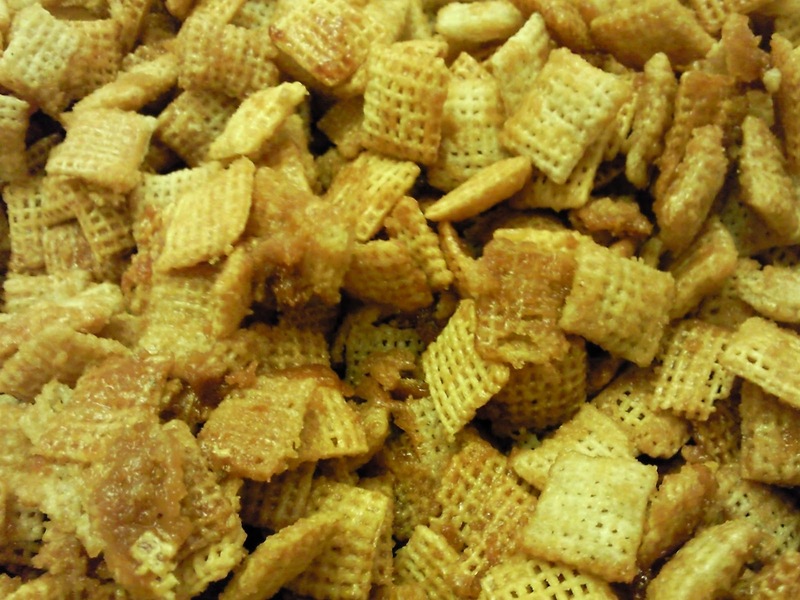 And of course, I have to have my Caramel Chex Mix, to snack on through out the weekend, too. Just sub the butter for soy-free margarine (I'm so happy this was on sale at Smith's Marketplace last week!). Mix the milk, oil and sugar in a pan. Scald the mixture (heat until just before the boiling point). Turn off heat and leave to cool 45 minutes to 1 hour. When the mixture is lukewarm to warm, but NOT hot, sprinkle in Active Dry Yeast. Let this sit for a minute. Then add 8 cups of all-purpose flour. Stir mixture together. Cover and let rise for at least an hour. When ready to prepare rolls: Sprinkle rolling surface generously with flour. Take half the dough and form a rough rectangle. 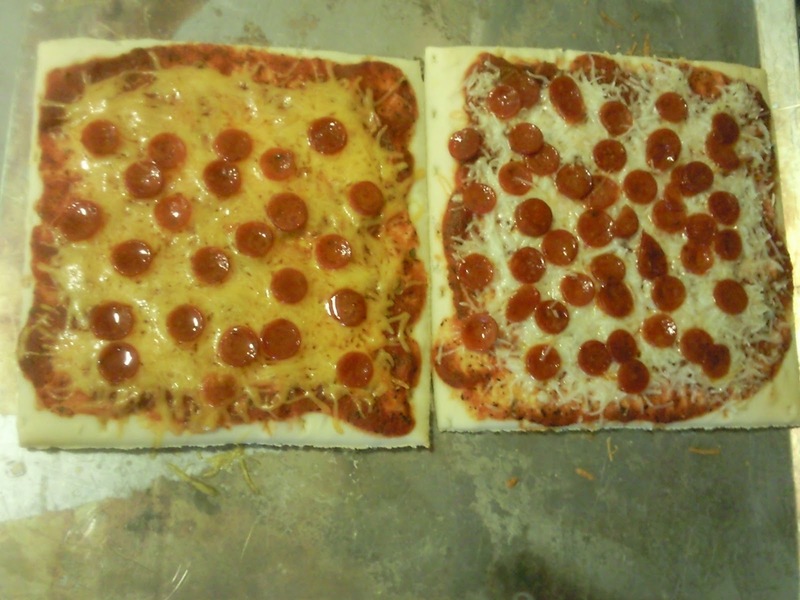 Then roll the dough thin, maintaining a general rectangular shape. Drizzle 1/2 to 1 cup melted margarine over the dough. Now sprinkle 1 cup of sugar over the margarine followed by a generous sprinkling of cinnamon. Repeat this process with the other half of the dough. 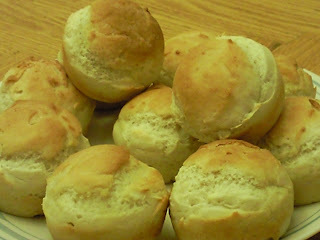 Let the rolls rise for 20 to 30 minutes, then bake at 375F until light golden brown, about 15 to 18 minutes. I am so happy to say that I actually have a dinner roll recipe! I have had so many failures in this department. But, I found a recipe that works, and it's good! And to top it off, it's gluten-free, dairy-free, soy-free, and egg-free...so I guess for you vegans, it's also vegan. :) I really can't take credit for its brillance, I just adapted it from The Pioneer Woman's dinner roll recipe (if you haven't seen her blog, you will now be an addict, even if you are gluten-free...she is amazing!) Below is the allergy-friendly version (which is also halfed, because it makes a ton, and we are only a family of 4), but you really should go to her website for her step by step directions...she does an amazing job! 1 tablespoon salt...and yes, you want this much salt! Pour the milk into a stock pot or dutch oven. Add the sugar and oil. Stir to combine and heat over medium to medium-low heat to scald the mixture. Once the milk mixture has scalded (is that a word? ), let it cool. It takes about an hour. The temp should be around 90-110F before you do the next step. When the mixture has cooled, add 2 cups of flour and the yeast, and mix well. Then add another 2 cups of flour, stir together and allow to sit, covered with a towel or a lid, for an hour or after its doubled in size. Add another 1/2 cup flour, the baking powder, baking soda, and salt to the mixture. Stir until combined. At this point you can cover it and put it in the fridge until you need it (so you can make this ahead of time) or you can go straight to the next step. Butter (using soy-free margarine) 1 to 2 muffin pans. From the rolls by pinching off a walnut sized piece of dough and rolling it into a little ball. Repeat and tuck three balls into each butter muffin cup. Once all cups have been filled, cover the pan and allow to rise for 1 to 2 hours. 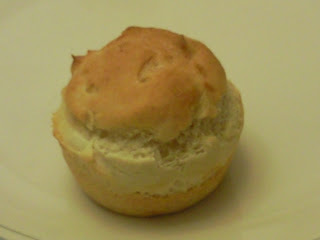 Top rolls with soy-free margarine and bake at 400F for 17-20 minutes, and top with additional margarine. Heat olive oil over medium-high heat and add carrots, celery, and onion. Cook 5-6 minutes, or until softened. Add garlic and cook 1 minute. 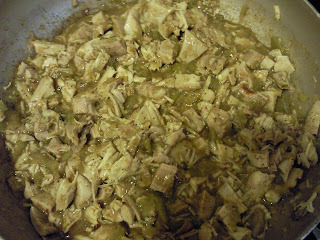 Add chicken broth, chicken, rice, and bay leaves. 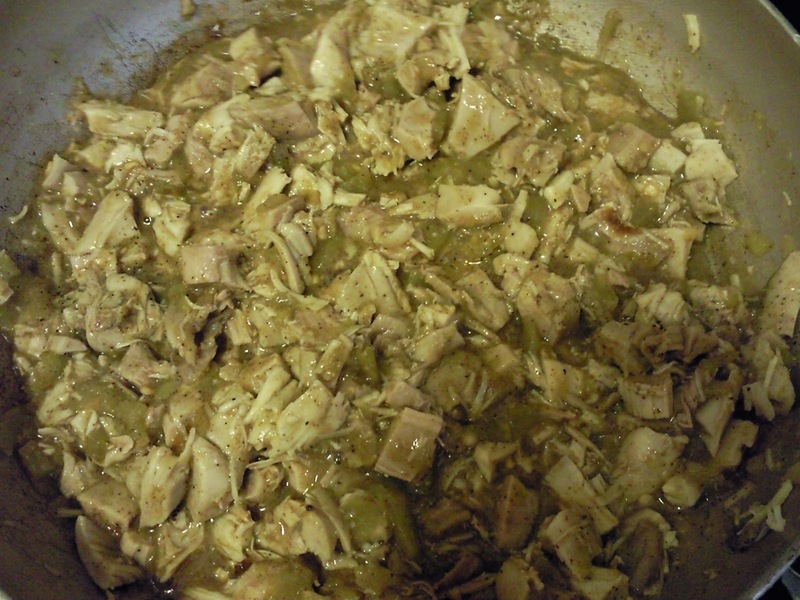 Bring to a simmer and simmer on low heat for 45 minutes or until rice is tender and chicken is cooked through. Remove bay leaves, add parsley. Melt margarine in a separate saucepan, mix in flour to make a roux. Add the roux to the soup and mix well. Add salt and pepper to taste. Note: the longer it cooks the thicker it gets, because the rice will continue to asborb the broth. Okay, I'm going to be using this a lot. This is Silvana Nardone's all purpose flour from Cooking for Isaiah. I'm giving her all the credit, because it is her blend...but a lot of my recipes are probably going to be using this blend, so I thought I'd pass it on, with my minor change--I use brown rice flour instead of white rice flour. 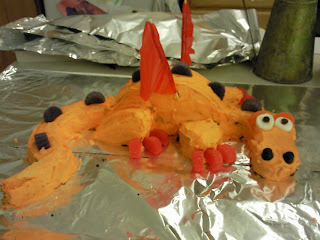 Update 1/25/12: I've decided not to have her recipe posted here. It's her recipe, so I feel it isn't fair to her for people to be coming to my site for her work. You can find her recipe on page 15 of her book, Cooking for Isaiah, which is part of the preview on Amazon. So, go to Amazon, check out the flour recipe--and buy her book, it's a good book. 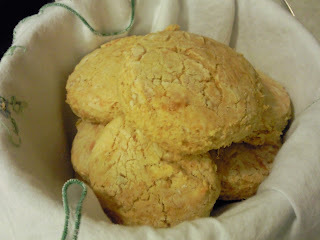 And, go here to check out my flour blend, it works really well, I really love it and use it now instead of Silvana's (her's is really good, too, though). I actually clipped this recipe out of my local paper of all places. 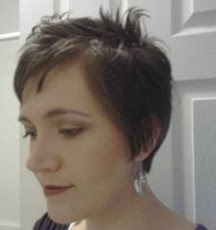 It's my Elana Ameterdam, the author of "The Gluten-Free Almond Flour Cookbook", she has amazing recipes. You can check out her blog here. I have had it on my fridge for a couple months now, and finally tried it out and am so happy I did. It worked perfectly with my soup last night that I took to a church activity. Below is the recipe with my slight modifications based on what I had on hand. I love bagels, but I never really ate them that much. So, going gluten-free I figured that was one of those bread items I could easily just live without. 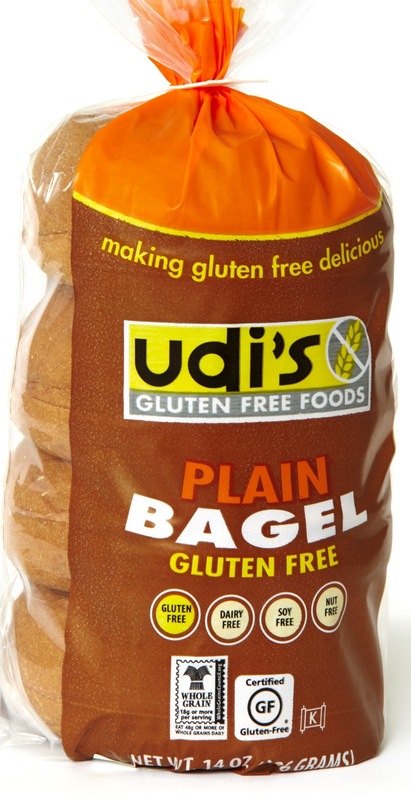 And honestly, I probably could, but my mother-in-law but us a couple bags of the Udi's gluten free bagels , so I had to try them....and I haven't been able to stop eating them since. They have the perfect bagel texture, chewy, but not to chewy, and not too heavy, yet they are nice and filling, so they make a perfect breakfast. I actually like these better than their white sandwich bread, and we are never without that bread in our house (mainly because my little ones refuse to eat my bread :P). I have been making ham and egg bagels for breakfast, and have been snarfing them down so fast I forget to take pictures. 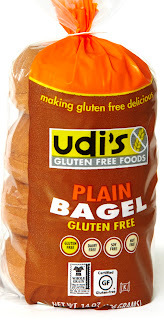 It's funny how something you take for granted in a past life, becomes a treasure in this one...how I love bagels now! Overall rating 10 out of 10 I honestly can't think of anything bad to say about it, other than maybe the price, but we're used to that, right? They are so, so, so good! Yes, it's gluten-free, dairy-free, and soy-free...and yes it has caramel! 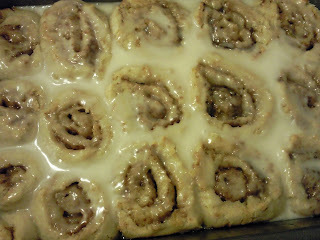 :) I found the recipe here, and it looked incredible. Anyone that knows me, knows that I'm too lazy to make pies, that's why we have crisps in my house...but I really wanted to try this pie and try out the pie crust from "Cooking for Isaiah", so Sunday night is the perfect time to test it out. Preheat oven to 425 degrees F (220 degrees C). Melt the margarine in a saucepan. Stir in flour to form a paste. Add water, white sugar and brown sugar, and bring to a boil. Reduce temperature and let simmer. Place the bottom crust in your pan. Fill with apples, mounded slightly. Cover with a lattice work of crust. 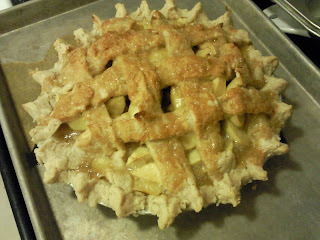 Gently pour the sugar and butter liquid over the crust. Pour slowly so that it does not run off. When I was small we had 3 walnut trees in our front yard, one is left, but that one produces more than enough walnuts. So, every fall my parents are kind enough to share. I love walnuts, I guess it's just comfort food that reminds me of home...and all the hours spent cracking walnuts. :) The one problem with walnuts is the bitter aftertaste caused by tannins or tannic acid. This is also why they turn black when cooked in dough or batter that has baking soda. But this whole diet change has opened my eyes to blanching nuts, and I have discovered that by blanching walnuts it removes the bitterness, and if you are willing to skin them after the blanching (I know it's a lot of work, but it's not that bad) it'll help remove even more, and some of the blackness that occurs with cooking. Because walnuts are so cheap in our family, I thought I would try to make a bread that would incorporate them. I didn't want a sweet bread, because there are plenty of those, I wanted a sandwich bread, an every day bread. So, I looked at Elana's Pantry since she cooks with almond flour, I figured I could adapt her recipe and at least have a start...and it worked! This recipe is also awesome because it incorporates my grandpa's eggs and honey into it, too. So, this is for my parents and grandparents...a bread in honor of all the memories created by home grown food. :) Just a warning, though, this bread is very filling, so slice it thin and plan on a small sandwich, because that's all that you will be able to eat. To blanch walnuts, bring water to a boil in a large saucepan. Add walnuts and remove from heat. Let stand for 2 minutes then pour off water. The skins can easily be peeled off after they have been blanched. Once they have been blanched, skin, and dried off, they can be ground up into a meal. I used my blender, but I would use a food processor if I had one. Just take a few at a time and pulse them to grind them up, don't do too much or you'll make a butter out of them. 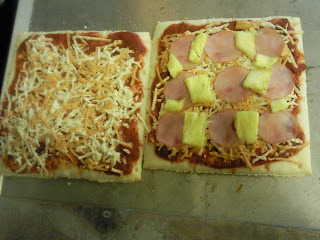 Cooking with Isaiah Part 2 and the best pizza ever, and I mean it this time! Okay, so I have already reviewed the cookbook, Cooking for Isaiah , but I am still testing her recipes, and they are so good I have to bring this cookbook up again. I made the banana pancakes with cinnamon goo (basically cinnamon syrup), and it was literally eating banana bread in pancake form with this warm, gooey, cinnamon syrup that just made it perfect comfort food. Sadly, all of my boys (husband included) were being picky that night and they ate regular gf pancakes--they definitely missed out. 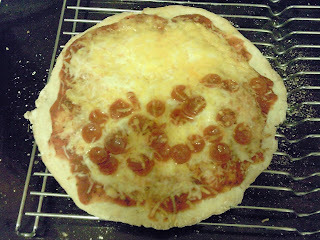 But when I made pizza, it was a different story. She has mastered the gluten-free pizza crust. Really, I think the key is using the pizza stone. I finally pulled mine out that I got when I was married, and realized why these stones exist...if you don't have a stone, go buy one, now, I mean it! Her crust is very simple and straight forward and it came out fantastic, crispy on the outside, chewy on the inside---and, and this is a big and, it was fantastic the next day for leftovers. Not just okay, it was actually fantastic! It wasn't in the least bit soggy, like every other gluten free crust I've tried, it was still crispy, and chewy on the inside. I have fallen in love...with a cookbook. My wonderful, wonderful Mom has helped me so much with this diet change. She got me a Nutrimill, so I can make my own flours. She also but a ton (and I mean she really did give me a lot) of brown rice flour, tapioca starch, and potato starch. She has really been so supportive in so many ways! I love her! Thanks, Mom! Anyway, to add to everything she's done for me, she bought me this cookbook. 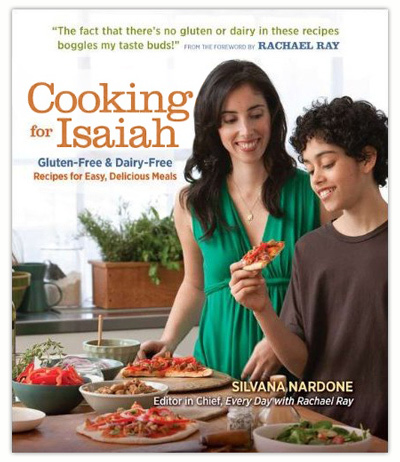 Cooking for Isaiah is a gluten-free, dairy-free cookbook written my a mom who is cooking for her son. That is exactly what I need! She also uses rice milk, shortening and oils, so every recipe is very easily converted to soy-free, yay!!! The Cinnamon Toasted Waffles are better than any cinnamon toast I've ever had...I gorged myself on them. The boys were a little more picky, but I know as they get used to the new diet, they will definitely eat these. The double cornbread was so good out of the oven, and even 3 days after the fact (I'm eating some right now). I made them as muffins instead of a loaf and it worked perfectly, but like any cornbread when it's cooled it crumbles a bit. My only complaint was when they were fresh out of the oven, you could smell the apple cider vinegar that was in it...she used the vinegar to sour the rice milk (mock buttermilk). 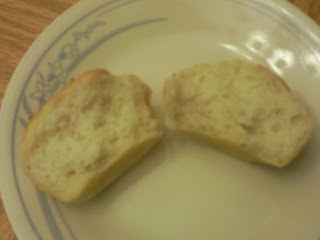 You couldn't taste the vinegar, just smell it...and the smell went away once the bread cooled. It was enough of a smell, though, that my little ones refused to try it, so I may just leave the vinegar out next time, or swap it with white vinegar or lemon juice. I had baked potato innards left from making the potato skins, so of course I had to try her baked potato soup. It was pretty good, but really it was even better as left overs the next day. I'm not kidding, let the flavors mature in the fridge overnight (with the bacon), and you will have a really, really, really yummy soup. One thing, or really two things that I really love with this cookbook is her recipes for all purpose flour and pancake mix. I've come across other recipes, and I had a basic one that I used...but I never actually prepped the flour beforehand and stored it as an 'all purpose flour' mix. With having these blends, she has made it so her recipes can be used by anyone. If you're not gluten-free, just substitute regular all purpose flour! :) And for those of us that are gluten-free, really make up a batch of the flour, stick it in the fridge, then when you need flour, you don't need to weigh out 4 different flours, just one, yay!! The only change I made to her flour blend is that she uses white rice flour, I used brown rice flour, and it worked very well. 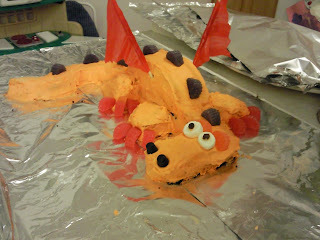 How to make an absolutely fantastic GF/CF/SF birthday cake for a 3 year old! I know it's a long title, but really this post is to tell you it's not that hard to make a fantastic birthday cake, and your kids will love you for it. I use the King Arthur's Cake mix, it's by far the best mix I've tried, and one less thing I have to do by scratch on a busy weekend. 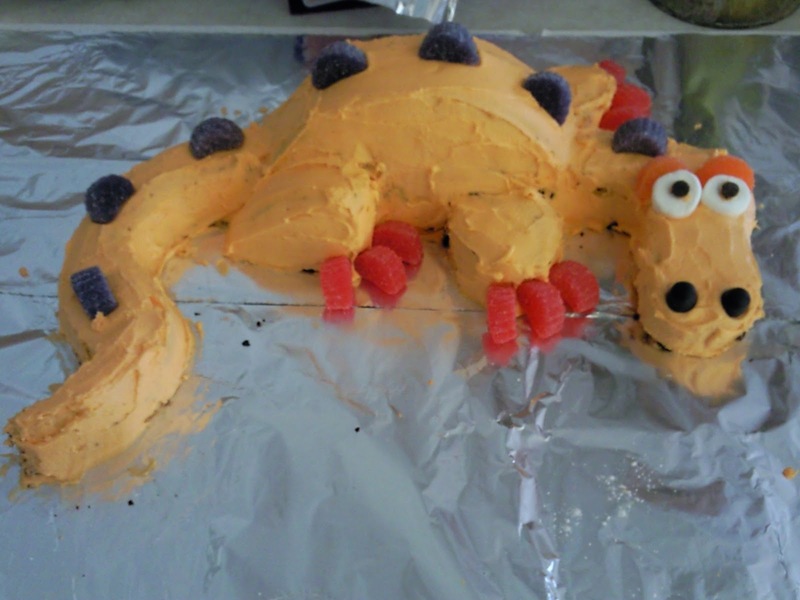 So, I asked my little one what he wanted for his birthday cake this year and he said a dragon (because he is absolutely in love with How to Train Your Dragon right now). Now I'm not a cake decorator or an artist, I'm just a mom trying to please her kids, so this isn't fancy, high quality work...but you don't need that. Just spend a little extra time decorating their cake and it will mean the world to them, especially if they are food sensitive. 1. Combine margarine and vanilla in bowl. Beat until light and fluffy. 2. Add milk and powdered sugar. Beat until mixture is smooth and creamy. 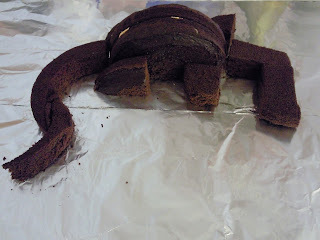 Note: if you want chocolate frosting add about 1/4 C cocoa and a tiny bit more milk to the mixture above. 1. It's easier to cut and shape a cake that's frozen. 2. Do a thin coat of the frosting to seal in the crumbs, let set and then frost a second layer that's thicker. Never judge a company by one bad experience! I'm so glad I haven't done that with Kinnikinnick, because there has only been one product (their bread) that we haven't liked, and this is no exception. 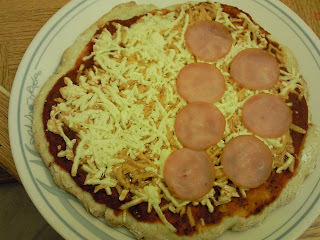 The Kinnikinnick Personal-Size Pizza Crusts is a pack of 4 personal size pizza crusts, perfect for our family of four. You keep them frozen until use, just top with sauce and whatever toppings, bake at 375F for 10-15 minutes and viola! 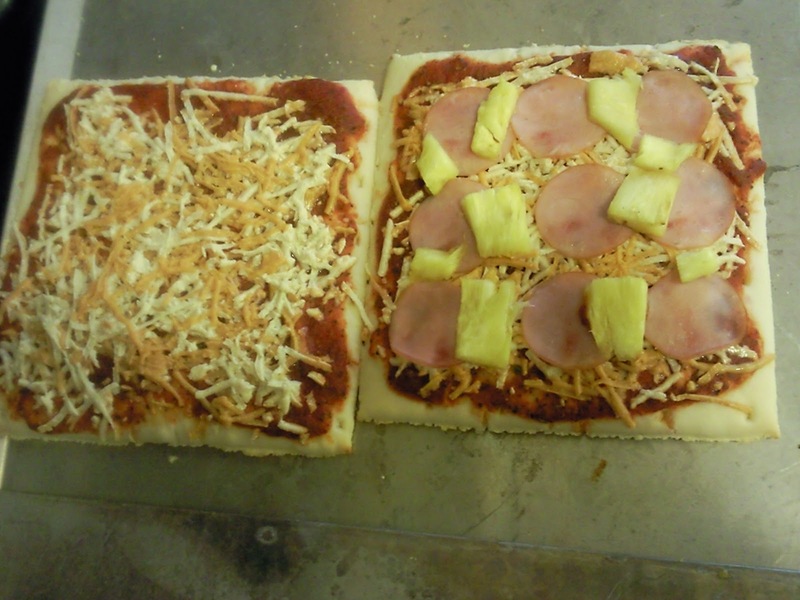 pizza, your very own! 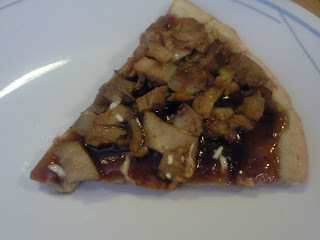 And its the best tasting crust we've had yet...my older one said, "Mom, this tastes like restaurant pizza!" Yay! The only downside was the boys didn't like the leftovers the next day...I didn't mind them, but I think I'm about as unpicky as you can get. Overall Rating 9 out of 10 Very yummy, even for my gluten eating husband, but didn't work as leftovers. I love Daiya, thank you for making dairy-free, soy-free cheese that resembles cheese! I wrote a review about their mozzarella shreds . Okay, this one is really good, too. It definitely reminds me of cheddar, or at least American cheese. ;) It makes great grilled cheese sandwiches, and when my little one saw he could eat orange cheese again, he kissed the package--if a 3-year old will kiss a cheese package, you know its good! Downside, like I said with the other post, no calcium, also it cost me $5.79 a packet. :( But we're used to paying extra for everything, right? Overall rating 9 out of 10 Really great taste and texture, but no nutritional value. 1. Preheat oven to 325F, and lightly grease (with canola oil) a bread pan or muffin tins. 2. Cream shortening and sugar until light and fluffy. Add eggs, mixing well after each one. Add Vanilla and pumpkin and mix until well blended. 3. In a separate bowl, combine remaining ingredients. Gradually add the flour mixture to the pumpkin mixture and stir until combined. 4. Pour into prepared bread pan or scoop into muffin tins, and bake ~1 hour for bread or 30 minutes for muffins. 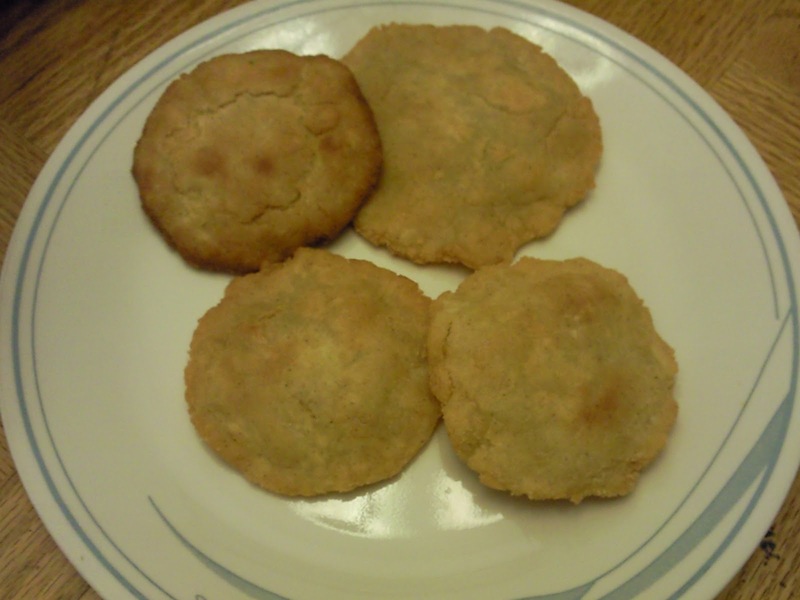 UPDATE 1/8/11: I now make them with 2 cups of my all purpose flour blend in place of the rice flour, potato starch, tapioca flour, and xanthan gum, and it works great! Okay, here's another side dish that will work perfectly with your Thanksgiving feast. No, it's not green bean casserole, but it's fantastic. I had thought about doing a gluten-free, dairy-free, soy-free version of green bean casserole, I saw plenty of recipes that would work, but you know what? The whole point of green bean casserole is that its a convenient dish, you throw a can of this in, with a can of that, top it with a can of fried onions, and ta da, it's a side dish. Well, that all just got thrown out the window....the convenience is gone, so really is green bean casserole really that good? I really don't think its that fantastic, maybe I'm alone in this. But I want simplicity, for goodness sake I have to make everything else from scratch, maybe I should try to simplify it all so I don't have a nervous breakdown. Heat oil over medium/medium-high heat. Add onion and mushrooms, garlic, and salt and pepper. Cook until onions and mushrooms have softened and cooked through. In the meantime, steam green beans to a tender crisp. Combine the mushrooms and green beans and cook for another 2-3 minutes to combine flavors. This post was shared on Gluten Free Holiday Thursdays. Okay, technically this isn't fully soy-free...the dairy-free chips that I used have soy lecithin in them, but many people with soy issues actually can handle the soy lecithin, so if you can't don't use the chocolate chips. :) Here is a link to the original recipe, to make it soy free use palm oil shortening in place of the margarine and make sure to grease the muffin tins or bread pan with canola oil instead of vegetable oil. 1. In a small bowl combine egg and milk. 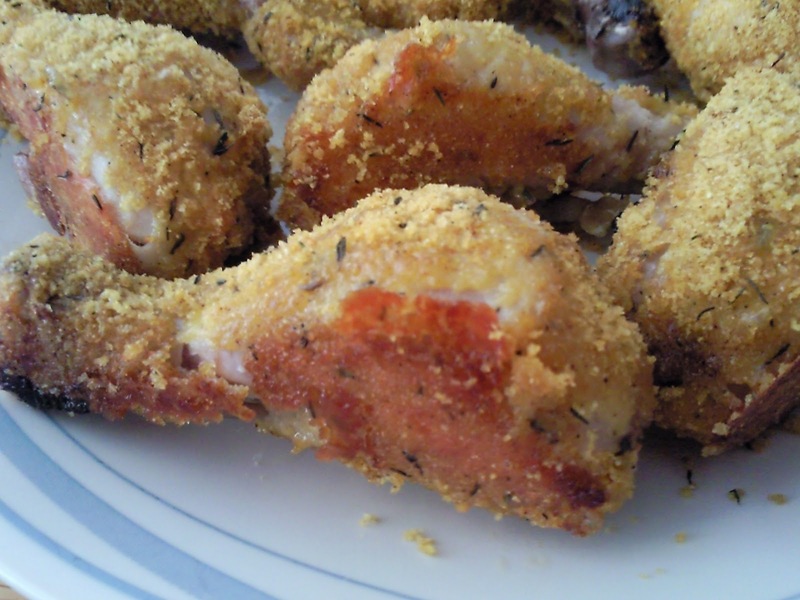 For coating, combine crumbs, thyme, paprika, sal, and peper; stir in olive oil. Skin chicken. Dip chicken into egg mixture, then coat with crumb mixture. 2. In a greased baking pan arrange chicken, bone sides down, so the pieces arent touching. Sprinkle peices with any remaining crumbs. 3. Bake, uncovered, at 375F for 45-55 minutes. Do not turn pieces while baking. Note: this also makes for great chicken tenders or nuggets. I used my left over crumbs for nuggets to freeze to take to daycare, they were very yummy. If you do use the left over crumbs for chicken nuggets, use them immediately, since the crumbs could harber harmful bacteria from the raw chicken and egg if stored for any amount of time. 2. Coat a medium sized casserol dish with canola or olive oil. 3. Combine sweet potatoes, sugar, salt, vanilla in a large mixing bowl. Whip by hand, if liquid is needed add some rice or coconut milk. 4. Pour mixture into baking dish. (tip: if you are doing this for thanksgiving, you can make the sweet potato part ahead of time, then stick it in the fridge until you're ready to bake it). 5. Topping: Combine brown sugar, tapioca starch, and pecans in a bowl. Cut in shortening. 6. Sprinkle the topping mixture over the sweet potato mixture. When I first took him off of gluten, I knew dairy was a problem, because his behaviors and sensory issues really hadn't improved a whole lot. I knew he did had a gluten problem, though, because of the 4 days of 'withdrawal' hell we experienced when we took him off the gluten. So, when we got the results back from Enterolab we immediately took him off the dairy. He did so much better that first week, he was happy, goofy even, he had normal bowel movements, was eating great, he was a normal kid, finally! But, the next week he started getting cranky, and having more of what I called bipolar moments, where his mood would suddenly and drastically change. I dismissed it as him being a 3-year old, come on 3-year olds can be quite moody, right? Well, by the next week, it was obvious it was more than him being misbehaving toddler. His behaviors turned aggressive and even violent. It truly frightened me, I know that something had changed in him and that's when I realized that we had easily tripled his soy consumption since going dairy-free. He was drinking soy milk, eating soy margarine, we were deep frying chicken nuggets and corn dogs in vegetable oil (soybean oil)...the list goes on. I was literally sick, what had I done to my baby!?!? Within minutes of having this sick realization, my sitter called me to tell me that something was wrong with him, that they really could not handle him anymore...could it be the soy? That was enough to confirm for me that (1) I wasn't imagining his behavior and (2) it was soy. So, we have a well child checkup on Friday, and I'm going to be bringing all this up with the doc then, but in the meantime we're cutting out the soy. We started the new diet on Saturday, and my baby is back, he's happy again (yes, he still has his 3-year old tantrums, but they aren't murderous outbursts now) and he's back to being a normal kid. I really am hoping and praying that this is the last intolerance we have to deal with. 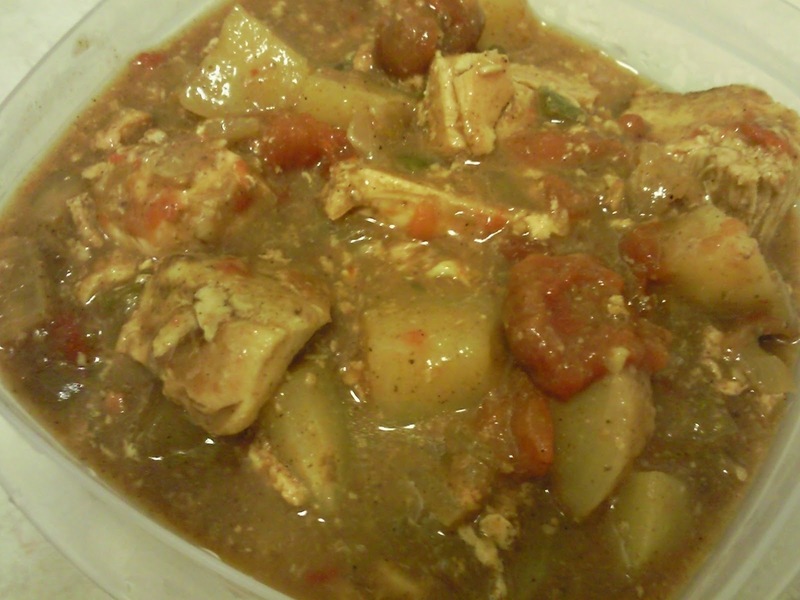 Put chicken into the bottom of the crockpot. Add potato and onion. Pour in tomatoes, and add garlic and all the spices. Cover and cook on low for 6-8 hours. Discard the cinnamon stick, and stir in coconut milk. If it still seems too runny, add in the corn starch mixture. Serve over rice.